Step 2 - Testing the body of a wine. Swirl the wine vigorously around the glass and then observe the wine on the bowl of the glass once the glass is held still. In some instances the wine will appear to adhere to the bowl of glass, in other circumstances there is little if any sign of the wine on the bowl. 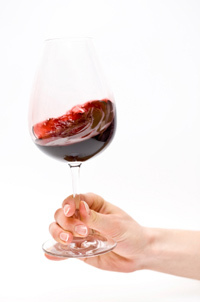 The far more a wine adheres to the sides of the glass, the greater its body.